Researchers are digging into heaps of discarded food to uncover clues about why we throw so much of it away—and how cities can cut the waste. Clumps of congealed pasta tumble out of tangled plastic bags, the noodles gone gray and fuzzy around the edges. In a loading dock a few blocks from Manhattan’s Union Square, bags of garbage spew their contents across white plastic folding tables littered with desiccated orange peels, egg shells, and the occasional shard of glass. Throngs of pedestrians trundle by outside, clomping along in winter boots and holding cups of quickly-cooling coffee. The January afternoon is tingly, prickly cold, and Belinda Li yanks down her respirator to say that was a welcome change. It had been considerably balmier a few months earlier, when Li and her band of fellow garbage sleuths were tearing into trash in Nashville. “Some of the stuff was really stinky,” she says. A few of the bags, cooked in the sun, had been wriggling with maggots. Tyvek suits, steel-toed boots, safety goggles, gloves, and respirators insulated the team against close contact. But they’ve spent months wrist-deep in kitchen scraps. Li, a project engineer at Tetra Tech, has been dispatched by the Natural Resources Defense Council to excavate hundreds of samples of trash in Nashville, Denver, and New York City—three cities where the NRDC has rooting or established relationships with local organizations. The bin digs are a quest to exhume data from detritus—and from there, to glean information about consumer behavior and food waste. Trashed food exacts an enormous environmental and economic toll: By some estimates, each American family spends some $1,600 each year on uneaten eats. “Imagine walking out of a grocery store, leaving one bag in the parking lot, and driving home—that’s essentially what you’re doing,” says Zia Khan, vice president of initiatives and strategy at the Rockefeller Foundation. Researchers and advocates know that the general scope of wasted food is unsustainable: It has environmental ripples across the supply chain, slurping up valuable water and then emitting greenhouse gases as it clogs landfills. But the nitty-gritty details are harder to come by. In order to help implement policy interventions, researchers and organizations needed to know exactly what was rotting away. One way to do that is to grab the trashed items before they end up in a heap. 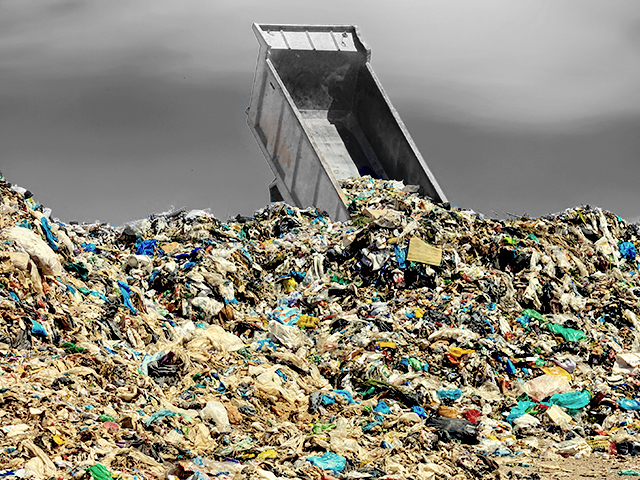 Backed by support from the Rockefeller Foundation, the NRDC has been conducting a sort of forensic analysis on residential and business-sector trash. In each city, researchers recruited households to keep week-long kitchen diaries, tracking what they tossed and why they bagged it (maybe it had turned moldy, or was inedible, such as an eggshell). Then, a subset of that cohort agreed to have their trash audited, says Darby Hoover, a senior resource specialist at the NRDC, who worked on the project. When it comes to mapping who wastes what, the data is scarce. Researchers know that in the U.S., most wasted food is squandered by consumers—to the tune of 27 million tons a year. In some African and Asian countries, the bigger issue is food loss, where produce withers or rots during production or in transit. It’s harder to point to more local culprits, though; the NRDC’s comparison is the largest of its kind. Researchers drove around to pick up the samples from businesses, homes, and the garbage chutes of dense apartment complexes. Back at makeshift sorting facilities, they sifted the contents into different bins: paper, metal, glass, prepared foods, and inedibles (such as peels or cobs). They hauled each container onto scales to determine the percent composition of the total—offering clues, Li says, about how much of the stuff festering in the trash could have been eaten or composted, instead. Plus, the qualitative diaries offered insight into why consumers threw away what they did, Hoover says. Pawing through the strata, Li adds, “we can get an idea of what the types of food are, but we don’t know if someone threw that out because it fell on the ground, or if it was starting to go bad in the fridge, or if it was something they didn’t like to eat.” While it’s too early to dissect the full findings, Li noticed that residential samples tend to be bogged down with coffee grounds and banana peels, and the commercial ones were stuffed with plastic containers and wads of paper towels. And if the data makes its way back to consumers, it could be a reality check, too—especially if it corroborates findings out of Johns Hopkins Center for a Livable Future. In a 2015 survey about behaviors and perceptions, 73 percent of respondents were sure that they wasted less food than everyone else. Now that the collection phase has wrapped up, the next step is data analysis—a lot of spreadsheets, and looking for similarities or differences across cities and sectors. Scores of small-scale, fairly localized food waste interventions have cropped up—supermarkets stocking shelves with dinged or misshapen foods; apps streamlining the process of redistributing surplus goods to get them to the hands and bellies that need them. Now, says Khan, there’s an appetite to create partnerships across industries and communities. Nationally, there’s a larger push to collect and crunch data about wasted food, and then make those stats publicly available with an eye toward shaping policy. Back in January, the Rockefeller Foundation—which is in the midst of a seven-year, $130 million food waste-reduction initiative called YieldWise—threw its support behind a portal designed by a coalition including the USDA and EPA. The Further With Food website allows users to zero in on the data that’s most relevant to them, sorting by audiences (such as students, restaurant workers, hunger relief groups, and lawmakers), sources (like academic, business, and NGO), and topics (including policy, meal planning, and food rescue). In March, the Harvard Food Law and Policy Clinic and ReFED, which issued a wide-ranging report on the state of food waste last year, will roll out a digital resource offering a visual breakdown of state-level regulations, so users can drill down on local laws about things like liability protections and date labeling. Organizations can “use it as a tool showing where other states are taking a best practices approach,” says ReFED’s interim director, Sarah Vared. The NRDC data, when it is collated and metabolized, could offer a blueprint for cities. The organization has already been laying the groundwork for collaboration, Hoover says. For the Nashville Food Waste Initiative, which launched in 2015, the NRDC has collaborated with local groups to ramp up composting infrastructure, and on an app connecting restaurants with nonprofits that can quickly absorb excess food. Last month, in response to a challenge issued by NRDC and the mayor’s office, a handful of restaurants pledged to help reduce food wasted in their kitchens. By the end of June, Hoover adds, the NRDC intends to spin this new data into a toolkit including sample protocols, case studies, and suggestions for scaling up solutions that have proved successful. The data could also be useful for entrepreneurs and policymakers trying to figure out how to bag waste on a local level. If a particular neighborhood trashes a lot of fruits and vegetables, Khan says, maybe area stores should issue meal-planning information, or the city could double down on compost initiatives. The food waste problem is sprawling and gross, but it’s also ripe for pretty sweet innovation.